Early diagnosis and treatment of mouth cancer can increase the survival rate up to 90%! The latest figures show that in 2011, 6,767 people were diagnosed with mouth cancer in the UK alone. That's 18 people every single day. One every 77 minutes. The number of new cases demonstrates an increase of over 30% in the last decade, with further increases predicted. More than 2,000 people lose their lives to mouth cancer every year in the UK - more than cervical and testicular cancers combined. Cancer of the tongue and oral cavity are the most common forms of mouth cancer. 86% of those diagnosed are over the age of 50. More than 90% of mouth cancers in men and 85% in women are linked to lifestyle and environmental factors. We all know the risk factors that increase the chances of developing mouth cancers - and our patients will be familiar with most of them. 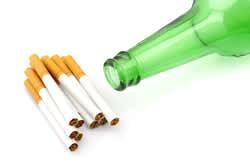 Smoking, excessive alcohol consumption and diet are all major contributors that probably receive the most promotion through public channels. Our patients are perhaps less awareness of other risk factors posed by existing oral conditions such as periodontal disease - mouth cancer is two and a half times more likely in those with the disease. Solar radiation and the human papillomavirus (HPV) should also be considered, with the latter set to overtake smoking as the number one cause of mouth cancer. The key to helping people survive mouth cancer is of course early detection and diagnosis. This can increase survival rate to around 90%. Delaying diagnosis lowers this rate to around 50%. By identifying those patients who are at high risk of mouth cancer, we can implement regular screenings to help ensure any abnormalities are recognised as quickly as possible. Continued patient education is also imperative. Supporting campaigns such as Mouth Cancer Action Month - which we can do through the social media Blue Lip Selfie campaign (#bluelipselfie) or by joining the Blue Ribbon Appeal and proudly displaying our blue ribbons - can help draw our patients' attention to the potential dangers of mouth cancer. The more people know and understand, the more likely they are to recognise early symptoms and seek professional help while there is still time to make a difference. It is also up to us to help change our patients' behaviours so as to reduce the lifestyle and environmental risk factors. There are various different models and theories available to explain the processes people go through in order to change their perspectives and ultimately their behaviours. Essentially, it's important to take a patient-centred approach. By building a rapport with the patient, adjusting the language you use to enquire about their personal goals, values and aspirations, you will be better able to establish what it is that will motivate them to change. This is called motivational interviewing and it has been proven more successful than a practitioner-centred approach. Not only will you develop a more stable and productive relationship with your patients, but you'll also be able to help them lead healthier lifestyles, reducing their risk of mouth cancer at the same time.